Flashing through the London underground music scene of the late seventies Punk Rock was the ultimate anti-movement, anti-fashion, anti-rock, anti- establishment. Its bands consisted of players untrained in music, looking to explode the heavy over produced rock of the previous generation stripping music down to its core. The music was banned from every venue and club in the United Kingdom from fear that it may dissolve the remains of Unity in the fragile political back drop of the time. The ROXY Club stood alone in its wish to promote this music against all odds, it survived just 100 nights but during its short reign cut through the pomp and self-satisfied operators of the music business who finally saw they had no clothes. This very personal book from the diaries and memories of this infamous club by Andrew Czezowski and his lifelong partner Susan Carrington. How it all came about, looking out from the centre of the maelstrom at the impact they were having during the most crucial 100 nights in PUNK rock music. It tells the fascinating story of the radical, anarchic 'ROXY CLUB' in 1977's Covent Garden, London. With its home-made ethos Andrew and Susan had no political agenda other than to live on their own terms, all they expected from others was to do the same. The ROXY Club's sounds, style and ideas still reverberate through alternative culture to this day. Illustrated with over 100 rare and previously unseen personal archive photos, flyers, rare artwork and newspaper clippings, diary entries, band contracts and other ephemera of the time, featuring exclusive quotes from some of the PUNK bands that played this historical club. The ROXY book will be a highly entertaining and visually stunning guide to a pioneering alternative to the mainstream UK music scene, a handbook of pluck and determination, and a refusal to accept the norm while painting on a new canvas without brushes. Night clubs have been a fixture of urban life for at least a century. From Speakeasies to cellar discotheques, they are the low-lit preserves of the city at play. A place to hold the night at bay; a club should imbue both intimacy and abandon. Although the alchemy for success is unpredictable, the ingredients are simple, music, punters and alcohol. Countless night spots have succumbed to obscurity; those black door-ways and garish neon signs that once promised so much are long since forgotten in the relentless redevelopment of contemporary cities. Rare are the clubs that make their mark on history; those few that have left behind an indelible imprint include The Cavern, The Marquee, Whisky a Go Go, Max's Kansas City, CBGB's and The ROXY. Although widely disparate, each was the flagship of a scene. From the Beatles to the Doors to the New York Dolls and The Clash, iconic pop culture is rooted in club land. It's not about money but purity of expression; the best night spots usually lean to the seedy. Punk's foremost club, The ROXY flourished despite it's less than salubrious neighbourhood. When enough time has elapsed we remember and succumb to nostalgia. In February 2013, the esteemed broadcaster Robert Elms fondly recalled The ROXY on BBC London, reminding listeners of London's premier punk haunt. It has been almost 40 years since Andrew Czezowski and Susan Carrington were unceremoniously ousted from The ROXY. Until then, they had run, fleet footed with the moment. Generous and idealistic, they turned a forgotten Covent Garden dive into the molten core of 1977, providing a platform for largely unsigned bands, including The Clash, The Heartbreakers, The Police, The Damned, Siouxsie & The Banshees, Generation X, The Buzzcocks, X-Ray Spex, The Vibrators, The Rejects, The Stranglers, The Slits, Johnny Moped. Virtually every single act that played The ROXY walked away with a record deal. Harpers & Queen magazine lauded the club, whilst John Bonham, Jimmy Page Robert Plant, Donovan and Marc Bolan came to pay their respects. The ROXY Book stands as a testimony to Punk's first feral season. Lavishly illustrated and containing quotes from Andrew Czezowski, Susan Carrington, Barry Jones (partner), Don Letts, Shane MacGowan, Jayne County, Brian James, Leee Black Childers, Walter Lure, Cherry Vanilla, Mick Jones, Tony James and Alan Edwards of 'The Outside Organisation' PR agency, The ROXY Book is both a visual and cultural record of a key moment in English Punk Rock history. Although Andrew continued to work with his latest charges, Generation X, the success of their inaugural gig at The Roxy, led to Czezowski and Carrington launching the club as London's sole Punk venue. As Shane MacGowan noted: 'The ROXY was the first place that the punks could think of as their own.' With the recalcitrant approval of Bernie Rhodes, The Clash officially launched the Roxy on January 1st 1977. Susan Carrington: "Having the Clash endorse The ROXY put us on the map. It was an amazing night. We squeezed in wave after wave of people. There were probably about 400 kids packed into a venue with a capacity of 100. After that night, our lives became a traveling circus, even though we stayed in one place." Although The ROXY enjoyed a high media profile, attracting the music, tabloid and fashion press, as well as a battalion of multi-national camera crews the club swiftly became a victim of its own success. Punk purists, Julie Burchill and Tony Parson's turned in an NME feature entitled 'Fear & Loathing at The ROXY' which only furthered the club's infamy whilst Peter York, writing for Harpers & Queen fondly sited the venue as a '35 year olds vision of hell'. Despite The ROXY's rapid ascension as the 'in' place to be, Czezowski and Carrington barely scraped by. Behind the scenes they staved off an unscrupulous land-lord with criminal affiliations, take-over bids by fashion and music scene elite not to mention threats of physical damage by bolshie band management and two robberies. Going beyond the perimeters of most rock histories, 'The ROXY Book' charts punk's integration into mainstream culture through first- hand accounts. 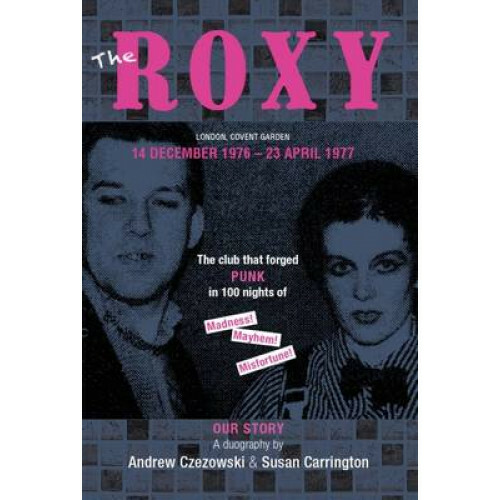 Although The ROXY's life-span was all too brief, by the time Andrew Czezowski and Susan Carrington were evicted from the venue in April 1977, they had made their mark on club-land.Andrew and Susan, the dynamic couple went on to create the most successful and influential independently owned club of the 80's and 90's, 'The FRIDGE' in Brixton London, another BOOK for another time.